AdSeal Satin is designed to give both flexibility of finish and outstanding results on unglazed natural materials such as Marble, Stone, Slate, Travetine, Terracotta, Also use on Engineered stone. This is a special high-build product , you choose whether you want a low decorative sheen or a satin finish. A ready to use solvent based protector. AdSeal Satin Finish is designed to give both flexibility of finish and outstanding results on unglazed natural materials such as Marble, Stone, Slate, Travetine, Terracotta, and also on Engineered stone. This is a special ‘high-build’ product – you choose whether you want a low decorative sheen or a satin finish. A ready to use solvent based protector. Simply apply one coat for a delicate colour enhancing low sheen and add further coats to increase the shine right up to a low gloss. 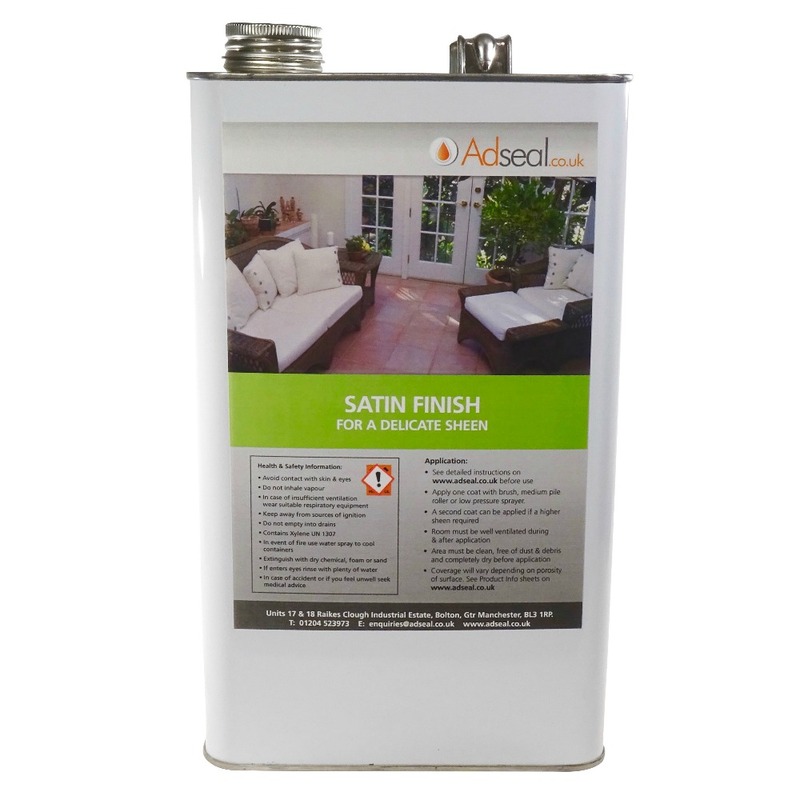 AdSeal Satin Finish largely prevents staining and facilitates routine maintenance plus it has very little effect on the slip resistance of the surface when applied as a low sheen single coat. Subsequent coats may reduce slip resistance. Indoors and lightly trafficked areas, with correct maintenance and depending upon surface type, potentially 10 years plus. Externally colour will remain for 1 – 2 years although protective effect will remain for longer, potentially 4 – 6 years, depending upon surface type. Should signs of wear appear a Maintenance coat can be applied. Clean and thoroughly dry surface to be treated. Apply single ‘tight’ coat in accordance with standard application instructions. The new coat will cross link into earlier coats so there is no need to strip unless resin build up or blemishes are an issue.